Galway Crystal Mystique glasses are available for wine and whiskey, and for Champaign, Mystique crystal flutes. Your bar or table will be complete with an assortment of Galway Crystal Mystique glasses from The Irish Gift House. Irish toasting glasses are cut by Galway Crystal in the Mystique motif. 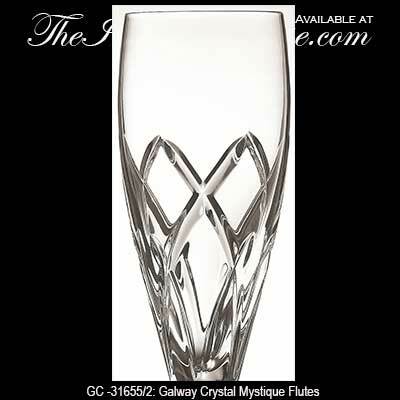 Irish toasting flutes are cut by Galway Crystal in the Mystique motif. Irish wine goblets are cut by Galway Crystal in the Mystique motif. Irish wine glasses are cut by Galway Crystal in the Mystique motif. Irish brandy glasses are cut by Galway Crystal in the Mystique motif. Galway Crystal glasses are cut in the Mystique motif; they are ideal for whiskey highballs.